Indian handmade paper cover with collaged tomato painting and decorative paper. 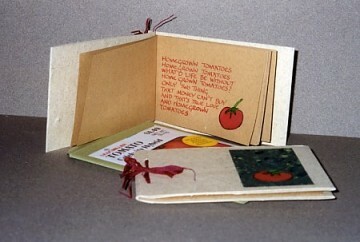 The text, a song called "Homegrown Tomatoes" was lettering on Fabriano Ingres text paper in tomato red. The book was stab-bound with raffia. Book 4¾″ x 3″ (12cm x 7.6cm).